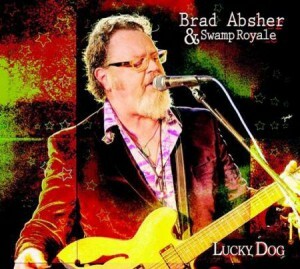 It is very surprising that Brad Absher is a new name to me as his music is right up my personal street! In fact this is Brad’s fifth album release and it’s a keeper. Raised in Louisiana and based in Houston, Texas, Brad’s music combines many elements of blues, soul and R n’ B with horns added to several tracks. The album was recorded in Houston and produced by Brad, label head Richard Cagle and Larry Fulcher. Larry is, of course, bassist in The Phantom Blues Band and is ever-present on this album. Brad’s regular bandmates Mike Patton on drums and Barry Seelen on keys form the core band with Brad (guitar and vocals) and Larry (bass); Andy Saad (tenor sax) and Anthony Terry (baritone sax) appear on half the tracks. Additional musicians are: Kyle Turner, tenor sax on one track, Nicoya Prolar, B/V on five tracks, Ed Starkey, bass vocals on one track, Samantha Banks, percussion on one track, Brian Thomas, pedal steel on one track. Brad wrote six of the songs, Larry and fellow Phantom Tony Braunagel contributed one, there is one traditional gospel song and four covers. For guitarheads Brad has provided the details of which guitar is used on each track. The album opens with four outstanding cuts. First up is Brad’s “Woman Who Loves Me” which opens with Brad’s choppy guitar (and later slide), Barry’s organ and the horns on a mid-paced rocker with a powerful chorus to which Nicoya’s backing vocals add considerably. Next up is “I Need A Drink” which is simply superb, definitely the top pick from the album. Propelled by a funky bass line and wonderful horn arrangement, Brad’s vocals are right on the money as he sings of how he can get past the current difficulties in his life: “I need a drink and I need some time, a quiet place where I can ease my mind. I really don’t have any kind of plan, gonna try to come out of this thing, come out a better man.” A rasping sax solo and Brad’s emotional guitar solo top off this great slab of Memphis soul. Bill Withers’ “Same Love” is well done with Kyle Turner’s sax featured and Larry’s funky bass driving the song, Nicoya’s soothing accompaniments blending well with Brad’s main vocal. “I Can’t Wait” is another solid soul-blues tune written by Brad with Barry’s piano and the rising horns pushing the tune towards its uplifting chorus. William Bell’s classic “You Don’t Miss Your Water” is often covered and Brad’s version takes the song back to its gospel roots on the longest track here. “Wanna Be Your Man” has swirling organ, growling horns and Brad’s strong vocal on another winning original. Allen Toussaint’s “Lipstick Traces” features a stripped down quartet with Larry’s funky bass, Brad’s choppy rhythm work, Barry’s Hammond and Mike’s crisp drumming. The traditional “Jesus On The Mainline” adds Ed Starkey’s bass vocals to good effect, especially on the acapella opening section; Brad’s slide work here is excellent and fits the tune well. Larry and Tony Branaugel’s “Trouble” is an uptempo piece which rocks along well with solid backing vocals supporting Brad. The album closes with “Memphis On The Way” which sees the return of the horns to beef up a tale of travelling south to avoid cold winters, Memphis being a logical stop en route. As befits such a theme there is a sax solo and the piano work also shines. Brad’s vocals are again spot-on, as they are throughout. This is an excellent album that deserves to be widely heard. Anyone who loves soul-blues will enjoy this one and it comes highly recommended. Now, I’m off to find some of those back catalogue Brad Absher CDs!